I have guilt. OOOHHHHH the guilt. But let’s limit this to my turophiliac guilt. I admit, since this IS Kate’s world of fromage, I’ve been highly remiss in the proportion of cheese entries to other entries (which may, indeed, be cheesy, but have not been about cheese often enough – an important distinction to make). I am also wistful. 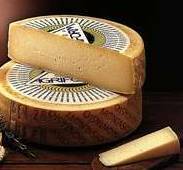 Let us definitely restrict the wistfulness discussion to the Käse. I am wistful about the mélange of cheeses that make this world a fantastically colorful place – replete with savory odours, textures and flavours (gotta have that “u” or it just doesn’t do justice to smell or taste). I’ve had neither the time nor the means to access any marvelous cheese, lately, and I must reflect, every so often, on the fond memories of some of the favorite cheeses of my life: Fromage d’Affinois, blueberry Stilton, Gorgonzola, sage Derby, good Feta, Babybel, REAL mozzarella, Pecorino, Parmigiano, nice Chèvre – I could go on forever – Gruyére and Emmental in fondue (maybe with some Jarlsberg – or was it Appenzeller? ), good ol’ Havarti. I don’t even remember the names of some of the best; a gift carried to me from San Francisco was almost unsurpassed – one of the cheeses had a big ol’ herby leaf right on the rind (festive AND tasty) and the other was very STRONG-smelling stuff (ash-covered, perhaps? )- both were to die for. Some friends, on different occasions, gave me some wickedly delicious Irish cheese, some lovely Italian cheese I hadn’t experienced before, and something else with a hint of cinnamon, (and truffles?) too. Those are helpful shopping tips, aren’t they? “If you have any of that cheese that has the big ol’ herby leaf right on the rind I’d like one half pound, please.” And to ask for “something strong-smelling” would be a little vague in a fromagerie. Be careful. You don’t want to end up in a “Cheese Shop“-type madcap adenture. Sorry. If, by chance, you fancy some actual cheese information, as opposed to the incoherent recollections of a negligent (yet still UNABASHED) turophile, here’s a site that’s truly educational: CheeseNet. It has a World Cheese Index (pretty basic cheeses, but nicely descriptive), Cheese Literature (I’m going to have to get some more cheese poetry), and “Ask Dr. Cheese!” (he could have done a MUCH better job talking about fondue, but “Dr. Cheese” is, I admit, a pretty cool moniker). *He who does not eat cheese will go mad.